512 Chai Chee Lane is located in between Bedok and Kembangan MRT. It is surrounded by residential housing, F&B and retail shops. A short walk from Viva Business Park which features Decathlon Sporting House retail space fronting major Upper Changi Road. As a standard ex-JTC flatted factory, this project offers warehouse / factory space for rent suitable for clean and light business (B1 category). Various sizes are available for warehousing, production, distribution, and office space (URA 60/40 rule applies). Most factory units for rent available are in bare condition with some rare occasion where there are fitted units for take-over. Layout of the units are also quite squarish. Some units on top floor are almost column free with a higher ceiling of up to 4m. Affordable rental rates from $1.40psf negotiable. 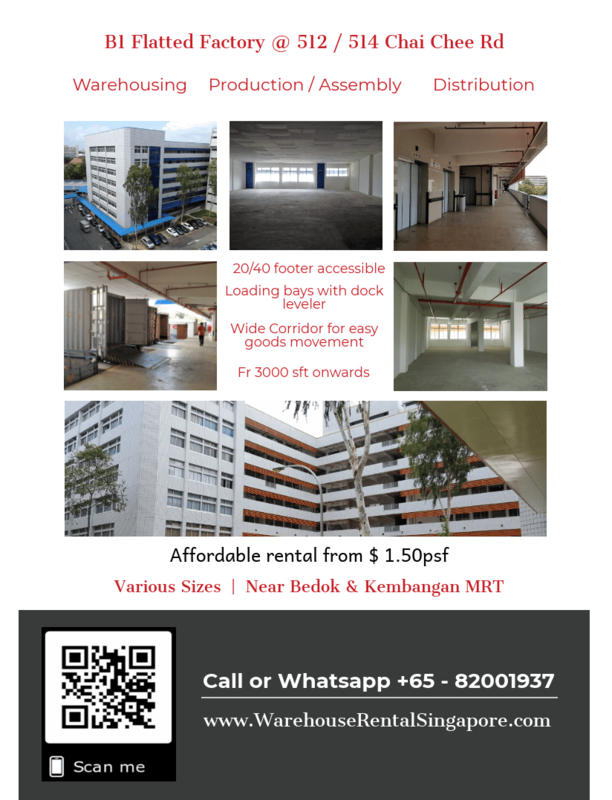 B1 factory / warehouse for rent, Flatted Factory, JTC Factory Warehouse.